So here we go again, the archaeo-bloggers are having a field day yet again with regards to what they are calling destruction of the archaeological record. I personally call it, sounding like a broken record. How many times have we heard that context is everything and that unless it is properly studied by trained archaeologists it will be lost and we will never know how/why/when the item was buried/dropped/lost. It seems to be the main argument that archaeologists or should i say the anti-detecting portion of archaeologists use to try and call for restrictions and or regulation of our hobby. So what is context? what knowledge can be gained by slowly and carefully digging around a urn full of roman coins for example. How can we find out why, when and by who these coins were lost for us to dig up hundreds of years later. What is it that archaeologists are looking for when they spends days digging a hoard out of the ground. It has always been my thinking that when a hoard of coins was buried it was due to a reason such as the person with the hoard was under some kind of threat or danger and wanted to hide their wealth to stop it being taken. Now, surely anyone who is hiding their life savings would be doing so as quick as possible to reduce the risk of anybody seeing them. I cannot imagine they would have taken time to drop things in the hole to add as evidence for the archaeologists to dig up hundreds of years of later so that we can complete the archaeological record. So what else could context be? is it the soil type or what its made up of. If this is the case why not dig a pit two foot away from where the metal detectorists dug the urn full of coins and go to the same depth surely this will be the same untouched soil and the same information will be there. I am not a trained archaeologist, in fact i know sod all about archaeology. I am a metal detectorist and as such have never been taught about context, so above are the conclusions i have come to by myself. I will quite happily concede that my own thoughts are rubbish if someone wants to comment on this blog post and correct me, someone who is trained and studies so called "context" on a daily basis. Because as far as I am concerned context is just an argument point that some use to try to drag metal detecting down. I eagerly wait to be corrected. Shock horror, metal detectorists find hoard! Metal detectorists find a Roman coin hoard in a pot urn. I want to start this blog post with a congratulations to the group above who unearthed an amazing Roman coin hoard during a club dig in the North East of England this weekend. A truly amazing, once in a lifetime find that is surely the envy of any metal detectorist who enjoys building the bigger picture of our history. It seems however, probably unsurprisingly to anyone who keeps up with what the archaeo-bloggers say, that that this is a complete travesty and total loss of information. The apparent loss of context being the main concern of the critics. Whilst i personally would never have dug up this hoard due to the fact that after digging more than a foot i would have put it down to being deep large iron or possibly drainage pipes, these guys carried on to a depth of around 3 foot to reach the coin filled urn. 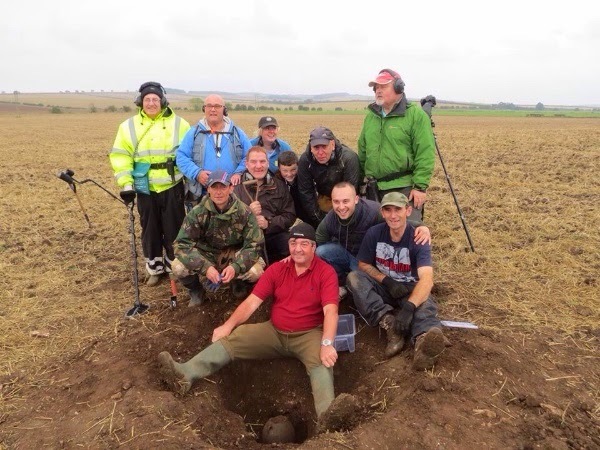 It is said that we should not dig below the plough level because we are digging into undisturbed soil but this is down to personal choice and what you decide is responsible and ethical in your approach to metal detecting. If I had one gripe with how this dig was handled it would be that the FLO and archaeologists where not on site to dig up the hoard once it was realised that it was indeed a hoard. Considering it was a Sunday and there were quite possibly non prepared to go to the site on a Sunday, the guys did a really good job of digging the urn out the ground. It does appear to be pretty complete and undamaged by the metal detectorists so in my mind given the circumstances they have made a good job of what could potentially turned into a bad situation. I know Paul Barford is doing his utmost to slate and cause a scene with a bombardment of blog posts aimed at turning this discovery into yet another outcry calling for regulation to our hobby. The chances of this hoard being discovered randomly by archaeologists was slim to non and now that the archaeologists know the find spot (thanks to the metal detectorists) they will be able to study the site in greater detail to uncover more of it's history. I wish the guys the greatest of luck with the treasure process and that they don't take the negative comments that are already showing to heart to much. Yesterday was the day, the day I finally managed to dust off the metal detector and head down to the beach for a few hours. Weapon of choice was the C scope cs4pi metal detector which is a pulse induction metal detector and as such has no trouble punching through the mineralised wet sand. It had been a while since i had last detected so first off i took a walk along the seafront looking for any low points or gulley's in the sand, unfortunately the beach looked pretty flat in all areas. I settled for an area that i had done well with last years winter an area that had produced plenty of pre-decimal coinage and also a gold ring for me. After digging a few test holes i managed to find an area that was only 8-10 inches above the clay layer which is well withing the cs4pi's reach. As always with Filey beach there was a lot of shrapnel and other military odds and ends to be found, i personally only keep the bullet casings that are in good condition such as the two in the photo that date 1941 and 1943 so during ww2. I managed quite a few pre-decimals including viccy penny's and some ship half penny's, also i found a florin and a shilling. Unfortunately most of the coins are very worn but dates can just be seen which is always nice. The mornings metal detecting finds. 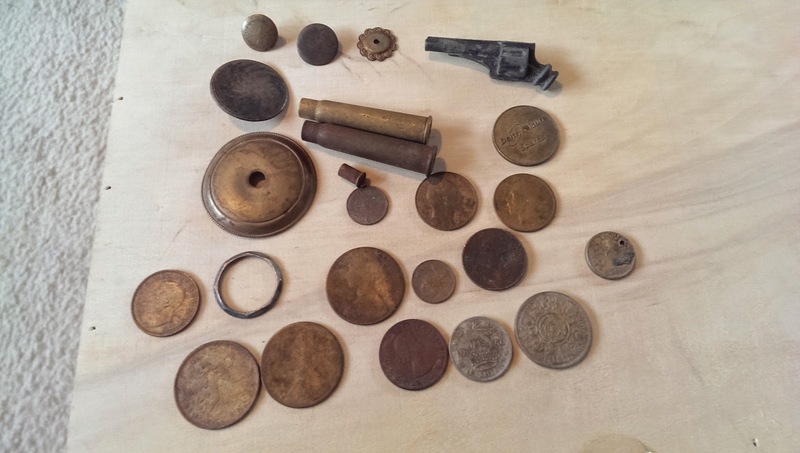 Along with the other items found where various buttons, a watch bezel and what i think is possibly part of a pocket watch and also a toy lead revolver. To prove how capable the c scope cs4pi metal detector is, I found the small bullet casing which i believe to be from a .22 round at a depth of 9 inches from very wet and salty sand. I really recommend it to anyone who is going to do the majority of their metal detecting on the beach. Now onto my favourite find of the day and also one i wouldn't mind some help in identifying. The coin below was found in an area which has a wooden groyne protruding out of the sand. I believe this area of the beach was used as an area to dock ships as it seems to throw up a concentrated abundance of pre-decimal coins ranging from around 1700-1830, so it is my guess that this coin was dropped by a well travelled sailor. 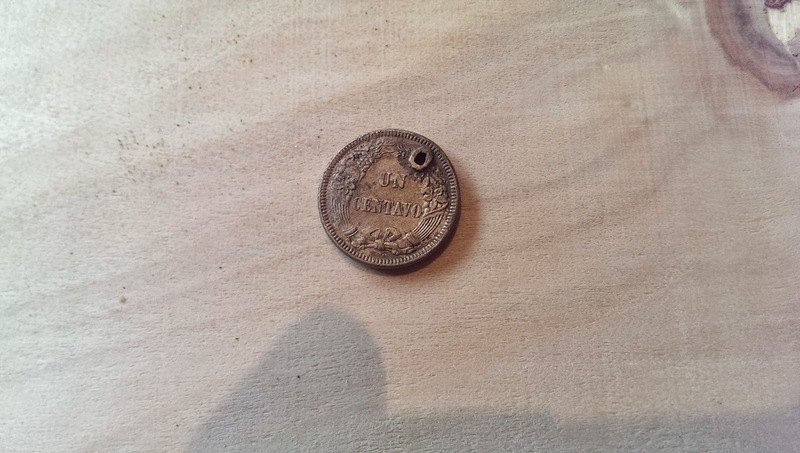 What I want to know is where the coin is from if you lot can help, all i can make out on the coin is Republic, Ruana and a date of 1863 on the other side of the coin its says Un Centavo. I am not sure why but i have a strange feeling it is possibly south American in origin but any help identifying it would be very much appreciated. It obviously meant a lot to whoever lost it as it has been holed to make into a necklace or some other jewelry. 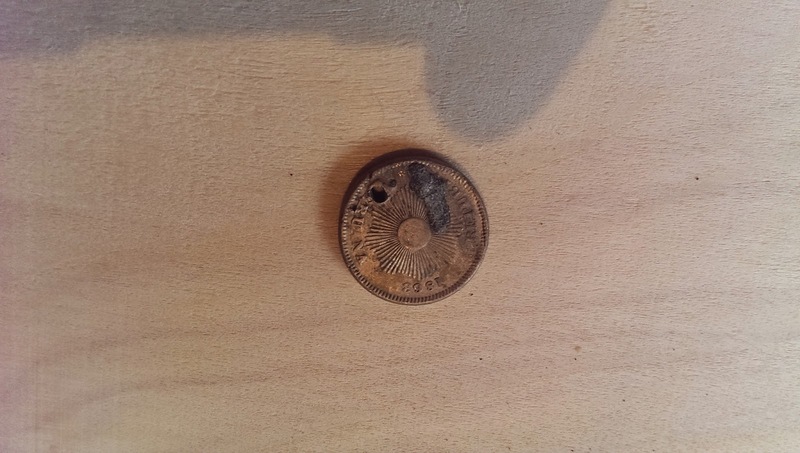 Unknown coin found with metal detector. All in all it was a very enjoyable few hours and it has relighted my love of metal detecting, i cant wait to get back down there.